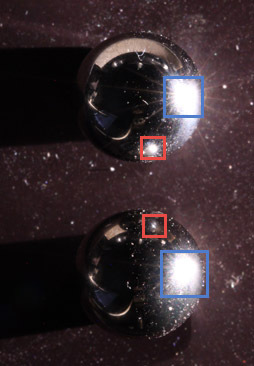 Specular reflections preserve polarization, but diffuse reflection does not. That's the standard story, but it's not the whole story. Specular reflections do preserve polarization, but they also redirect the ray. Polarization is preserved with respect to the ray direction and the surface orientation, but the absolute direction of polarization is changed. If the redirected ray is then specularly reflected off another surface, the same thing happens. Depending on how the surfaces are oriented, you can end up with multi-bounce rays coming toward the lens with the polarization rotated to any angle at all. If the surfaces are oriented randomly, then the polarizations are random also. I can illustrate this effect using a very simple scene consisting of two shiny steel balls, mostly illuminated from the right side by polarized light. There's another polarizer on the camera lens. Here is an image of the scene, with and without annotations. In the annotated version, I've drawn blue boxes around the primary one-bounce specular reflections. 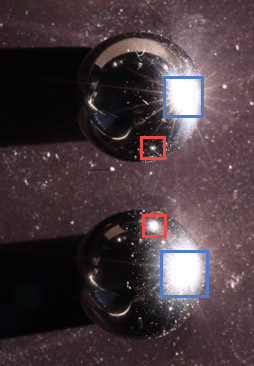 Then I've drawn red boxes around the primary two-bounce specular reflections. 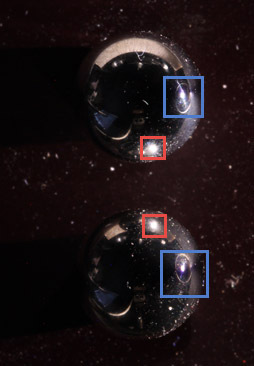 These two-bounce reflections are caused by light bouncing sideways off one ball, striking the other ball about half-way up the hemisphere facing the camera, and being reflected up into the camera. Now, by rotating the polarizer on the camera lens, I can arrange to kill the primary one-bounce reflections, or the upper two-bounce reflection, or the lower two-bounce reflection, but there's no way that I can kill even two of them at the same time! Here are those three cases, first as single frames and then as a continuous animation. I'll let you work out the details of how things get rotated. I find them quite difficult to explain even to myself, let alone to anybody else. The point is just that multiple bounces can cause the angle of polarization to rotate. I think this is not the same phenomenon as the usual distinction in which surface reflections retain the polarization of the illumination but subsurface reflections resulting from absorption and re-emission do not. Certainly there's nothing in this scene except for specular reflecting spheres, plus some miscellaneous stuff like balsa sheets in the environment around them that we're ignoring. This posting was prompted by the discussion about diatoms and cross-polarization, HERE. I initially posted this as a reply there, but then decided it would be more generally useful as a separate thread. Great demonstration, and an effect I had never heard about before. Could it be that non-specular reflection is generally just specular reflection off roughened surfaces so that this randomization happens? Yes, Lou. You've got it. Microscopically, there really only is specular, it is the surface roughness that leads us to the term diffuse, as the scale we are viewing it at increases. Just think of it as each minute point has it's own angle, causing Fresnel reflection depending on the plane of polarization. If the surface is rough, we see it macroscopically as random, but of course it is actually deterministic. ...what if it were atom mirror instead of shiny steel balls. Individual atoms are too small to have much interaction, because of diameters that are roughly 1000 times shorter than the wavelength of visible light. But non-homogeneous collections of atoms at larger scale, sure. For further reading, consider "A Physical Model for the Polarized Scattering of Light" at https://www.sci.utah.edu/publications/brayford08/eg_uk_DavidBrayford.pdf (8 pages). In addition to the angles of surfaces, the molecular structure also matters. There's a big difference between metallic surfaces that retain the angle of polarization (if any), and dielectric materials that can alter the angle or produce polarized reflections even when the illumination is non-polarized. 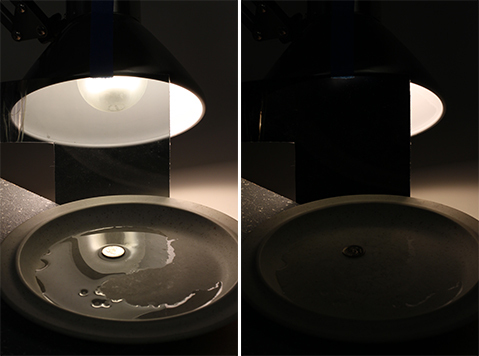 As a quick demonstration, if you set a coin in a shallow pool of water, illuminate with non-polarized illumination like normal room light, and look at the combo through a polarizing filter like sunglasses, then it's easy to see that the polarizer cuts glare from the water but not the coin. 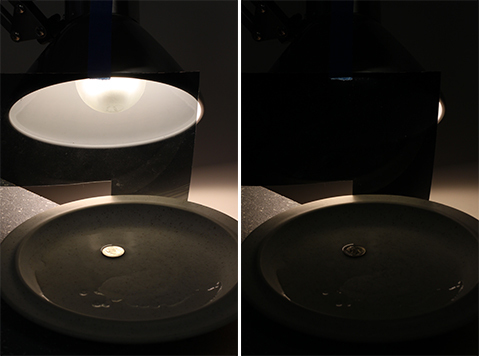 However, if you illuminate with light that is polarized at say 45 degrees, then the viewing polarizer can be adjusted to kill reflections from the coin or the water, or direct from the illumination, but again, not any two at the same time. Here's an illustration of that effect. No lens polarizer on the left, three different angles for maximum extinction on the right (direct, reflected off water, reflected off coin). In this case the coin never goes to complete extinction, although it does in other tests shown below. I suspect what's going on there is that the reflection from coin is coming partly from regular metal and partly from a dielectric oxide layer on top of that. More about reflections off dielectric surfaces can be read at Wikipedia, Brewster's angle .